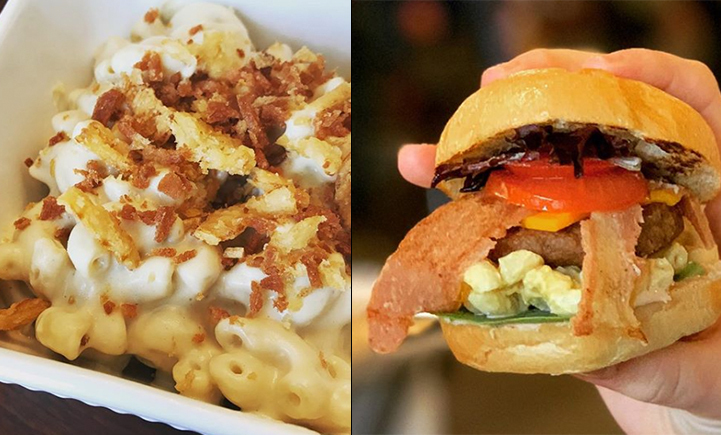 Parlor City Vegan's house made truffle cheddar mac & cheese topped with vegan bacon crumbs (left) and bacon burger slider with mac & cheese (right) Image Credit: Instagram/@parlorcityvegan. Parlor City Vegan's house made truffle cheddar mac & cheese topped with vegan bacon crumbs (left) and bacon burger slider with mac & cheese (right) Photography: Instagram/@parlorcityvegan. Mac & cheese. Chicken wings. Burgers. These mouth-watering delicacies are staples of American comfort food, but despite being loved by the masses, they aren’t the friendliest to a number of diets. And yet ... they taste so good! Sara Liu ’06 recognizes the irresistible nature of these foods and has made it her mission to make them accessible to everyone. Liu comes from a multigenerational line of accomplished home cooks and grew up cooking with her mother and grandmother. A vegetarian for almost 13 years, she’s mastered the art of putting a vegan twist on popular dishes. After her father suffered a heart attack two years ago, she realized she could help him change his diet without withholding the foods he really enjoyed. “My father had a diet that included a lot of meat and dairy and comfort foods. During his recovery, I brought him vegan meals that were based on those meals he really enjoyed, and he really liked them,” she says. His reaction surprised her and also sparked an idea. 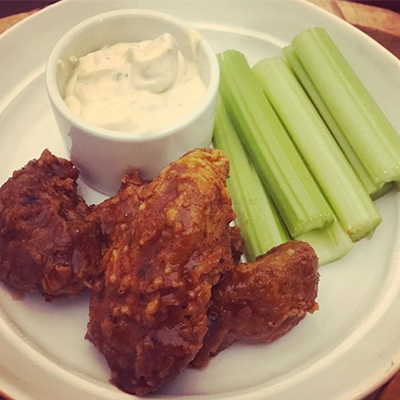 Parlor City Vegan's root beer BBQ wings with blue cheese and celery Image Credit: Instagram/@parlorcityvegan. “He’s a very blue-collar guy. I thought that if he liked them, others might like them as well, especially if they were experiencing similar health issues,” she says. And so began what is now known as Parlor City Vegan, the company she and her husband, Lei Liu ’04, MBA ’07, founded in 2016. The couple started by selling their made-from-scratch, plant-based comfort foods at the Broome County Regional Farmers Market on weekends. “We sold out immediately on that first day, and demand has only grown since then,” says Sara. All it takes is a look at their Instagram to see that Parlor City Vegan boasts a version of just about every classic guilty pleasure meal you can think of. Ribs, lasagna, cupcakes, pizza — they have it all. But their most popular plate, by far, is mac & cheese. That cheese is gaining popularity, and a number of Binghamton restaurants have started using it in their menu offerings. “A lot of vegan cheese on the market has issues where the texture might be off or the flavor may be a little weird. We’ve gotten great feedback on our cheeses, with people telling us that ours is very close to the taste and texture of traditional cheeses,” she says. It’s been that feedback that has surprised them the most — and not just from vegans and vegetarians. Sara Liu says that roughly 40 percent of their customer base identifies as omnivorous. 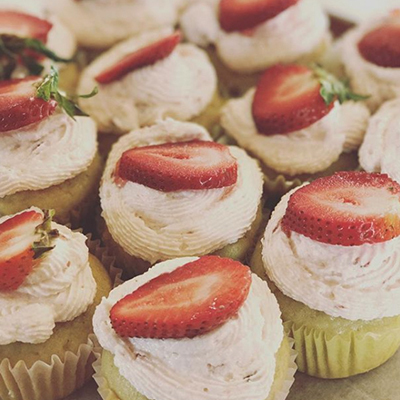 Parlor City Vegan's strawberry cupcakes Image Credit: Instagram/@parlorcityvegan. “We love that we’re reaching all kinds of people. We’re happy to reduce consumption of animal products, and if people love our food in the process, then we’re doing something right,” she says. The couple has even started catering weddings and other large events. The success they’ve found in such a short amount of time is a testament to the hard work they put into the business. Both Sara and Lei have full-time jobs outside Parlor City Vegan, but they spend the majority of their nights and weekends doing the work for their startup. And because they don’t yet own a commercial kitchen, they rent space in a number of commercial kitchens in which to prepare their food. “All we do is work right now, but the hustle is worth it,” says Sara. A number of factors have helped propel their growth. Sara participated in the accelerator program at the Koffman Southern Tier Incubator (a crash course on how to determine if your product has a market), and the company won the City of Binghamton’s small business plan competition in 2018. The couple hopes to continue building on this momentum, and they’ve set goals for the business. One of those goals is to open the area’s first 100 percent vegan cafe. They started a Kickstarter campaign to raise funds for it, and the community responded enthusiastically. Not only did they hit their fundraising goal of $7,000 — they exceeded it by almost $5,000. 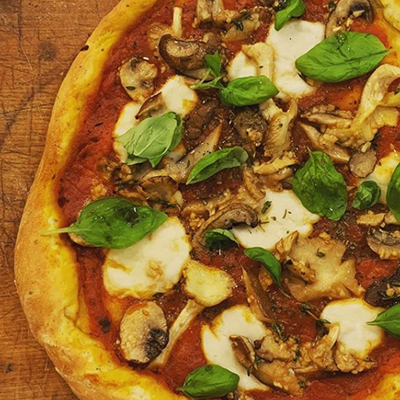 Parlor City Vegan's homemade pizza with fresh mozzarella Image Credit: Instagram/@parlorcityvegan. “We met our goal in only eight days, which was astounding. We can’t believe the support and generosity from the community and our investors, and it’s exciting to see how many people share our vision,” says Sara. With many opportunities for growth ahead of them, the couple look back at their Binghamton University education as a vital component to their success. “Lei is an industrial engineer. He was a Watson undergrad and earned his MBA from the School of Management, focusing his studies on supply chain management. That experience has allowed him to streamline our processes, handle inventory and think as lean as possible about what we’re doing as we get things off the ground,” Sara says about her husband. As for Sara, she is a Harpur graduate with a degree in history. She believes her education has allowed her to put a new spin on starting a business, similar to how her creations put a new spin on traditional dishes.